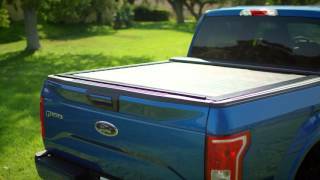 In order to ensure a proper fit, please measure your truck bed prior to purchasing your new LEER tonneau cover. 1. Place the end of your measuring tape at the bulkhead of your truck bed. 2. Moving down your bed rail, measure to the inside edge of the top of your tailgate. 3. Most truck manufacturers round their bed sizes, so choose the option in the fitment bar that is closest to your measurement.